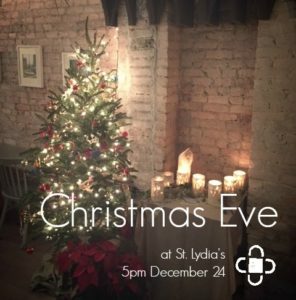 Celebrate the coming of Christ at St. Lydia's! Through Advent, we waited for God's in-breaking. Now, we celebrate in joy that Christ has come to live among us. 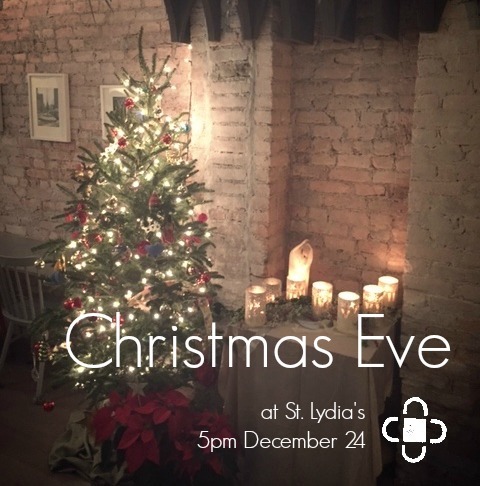 St. Lydia's will celebrate a joyful, informal Christmas Eve service at 5:00 on December 24. There will be caroling, an impromptu pageant, and celebratory food and drink! Little ones (and big ones too!) are invited to bring their own angel wings, sheep or shepherd costumes, or use the ones we provide. All are welcome! Please note: there will be no services on Monday, December 25 or Sunday, December 31. Dinner Church returns on Monday January 1, 2018 at 7pm.